The Head of the UGCC prayed for Ukraine at St. Sofia Cathedral together with the President and members of the AUCCRO The Father and Head of the Ukrainian Greek Catholic Church, His Beatitude Sviatoslav, at the St. Sophia Cathedral on Independence Day of Ukraine together with the President of Ukraine, Petro Poroshenko and his family, prayed for Ukraine. 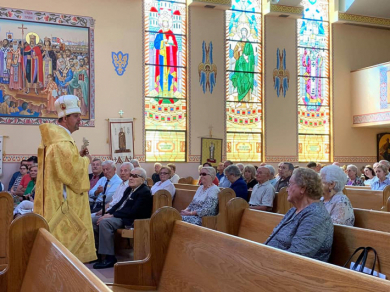 Hundreds Journey to an abandoned Pennsylvania coal town for A Call to Prayer Marian Pilgrimage on the Holy Mountain Only a few structures still stand in what was Centralia, Pennsylvania. Even fewer are visible through the tree cover from the top of an adjacent mountain overlooking what was once a thriving community. 5 FACTS ABOUT “VOLODYMYR STERNYUK: THE PRIESTHOOD DURING THE UNDERGROUND PERIOD” DOCUMENTARY Since the beginning of November, the audience had the opportunity to watch the documentary “Volodymyr Sternyuk: The Priesthood during the Underground Period” on “Pershyi Zakhidnyi” TV (First Western TV) and ZhyveTB (LiveTV). So That Mercy Can Enter God always loves us unconditionally because mercy is his very nature. Said another way, because God is love, God is mercy. PASTORAL LETTER OF THE UKRAINIAN CATHOLIC BISHOPS OF CANADA ON THE OCCASION OF THE NATIVITY OF OUR LORD 2015/2016 To the Very Reverend Clergy, Monastics and Religious Sisters, Seminarians and Laity of the Ukrainian Catholic Church in Canada: Christ is Born! Glorify Him!